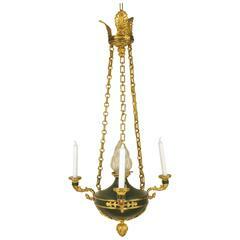 An ornate French Empire style chandelier in gilded bronze and deep green tole, late 1800s or early 1900s. 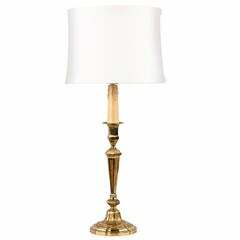 The painted tole is spindle shaped and a dark, luxurious green. It is adorned with copious gilt bronze pieces. Branching out from the tole body are eight lighted arms, each loaded with details such as acanthus leaves, shell and foliate decoration, finely executed floral relief and water leaf embellishment. All are topped with faux candle lights. Between each light there is gilt laurel and sunflower decoration. Perched along the top rim of the tole piece are alternating palmettes and tiny finials. The bottom is graced with acanthus, more palmettes and a Fine pinecone finial, the top by a lovely torchere. Four ornate chains connect the body to its gilt canopy, complete with flowers and pierced palmettes. It is a truly impressive piece that will elevate any space. Fixture measures 33" from base to top of crest. Chain and canopy add 13" to fixture. Good condition. Some scratches on the top of the tole piece, not visible when hanging. 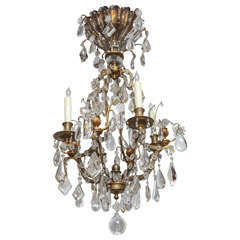 1900's French Bronze Bagues 8 light Chandelier. Newly wired. 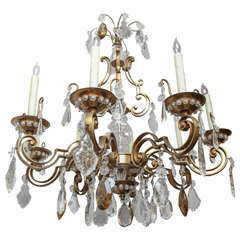 Very fine 1900's French Bagues Dore Bronze and Crystal Chandelier with 4 lights. A beautiful crystal canopy adorns the top. Newly wired. 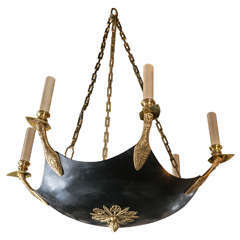 c. 1900's French empire style chandelier.